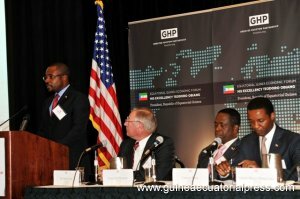 As a follow up to the Economic Forum held by HE Obiang Nguema Masogo, President of the Republic, and Head of State in Houston (Texas) on June 10-13, 2012 hosted by the Greater Houston Partnership, a United States Economic Entrepreneurs Multidisciplinary Mission is being invited to visit Equatorial Guinea in February 2013. The objective of the Mission being led by MAECI (Management & Economic Consulting, Inc.) is to discuss economic development projects and investment cooperation opportunities in different economic and social sectors with Equatorial Guinea. In addition to projects of multidisciplinary nature, the mission is to more specifically discuss projects and investment cooperation opportunities within: the ministries of Health, Industry, Energy, Agriculture, Information and Telecommunication, Finance, Commerce, and the Ministry of Economic Development. This will be the first time a United States multidisciplinary Economic Cooperation of this importance has visited the country.